SHAPER:Possibly shaped by W. Hardie. by Honey Surf, Gerringong NSW. 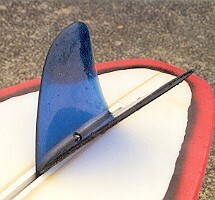 Horan/Lexan Star fin, as used on later models.Image Below. Bottom: 'Gordon and Smith/Sydney/Australia' white rectangle, off-set at sweet spot. Sprayed wide railed deck panel of grey and pink off-set bands. Sprayed white large off-set script 'Section/Eight.' Black pin lines. Bottom: Sprayed wide railed deck panel of blue and pink off-set bands.Black pin lines. Purchased Cash convertors, Miranda NSW ? No-nose, wide tailed single fin board designed by Geoff McCoy for Cheyne Horan, 1979-1984. 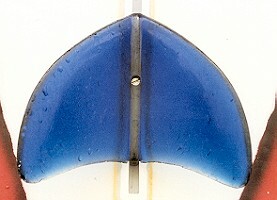 Later models featured Ben Lexan/Cheyne Horan’s Winged Keel/Star fin, see image below. Reprised 1998 as the Nugget -a Thruster finned model by McCoy Surfboards, see #167..
Horan/Lexan Star fin, as used on later models.